Inventory We are a resale marketplace, not a box office or venue. Ticket prices may exceed face value. This site is not owned by Dolby Theater . The Dolby Theatre, formerly the Kodak Theatre, recently opened in 2001 and is currently home to two of the biggest television programs in the country, the Academy Awards and American Idol. 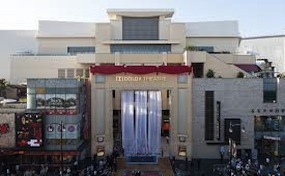 The Dolby Theatre box office is located at 6801 Hollywood Boulevard in downtown Los Angeles, California. The venue provides a very intimate setting with a seating capacity of only 3,401. Dolby Theatre tickets have included such great performers as Celine Dion, Beyonce, Mariah Carey, Andrea Bocelli, Christina Aguilera, Prine, and Barry Manilow. Other popular shows that have featured the Kodak Theatre include So You Think You Can Dance, Miss USA, the ESPY Awards, the BET Awards, and the Emmy Awards. TheatreHollywood.com is not currently affiliated with any official website, supplier, venue, or box office. We are independently owned and operated and specialize our efforts in all sales in the secondary market. Listings on our websites may be below or above face value. To order tickets to all Dolby Theatre Los Angeles events simply navigate through the online marketplace through the checkout or for further assistance call our operators at anytime.